Everyone think happy thoughts for baby Kate who has a little fever. Poor thing. Shawn's a bit under the weather, too. Just been one of those weeks at the Patterson's. Let's dig into some taters, shall we? 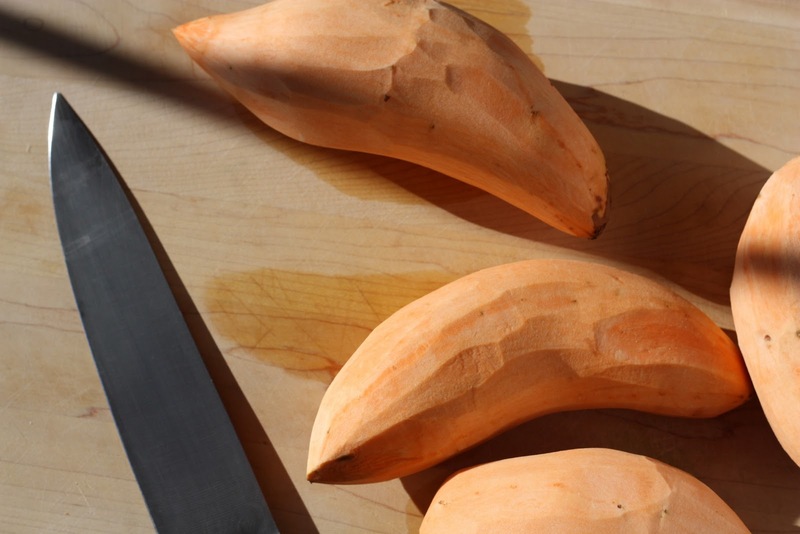 Today we're talking about sweet potatoes, a veg I thought I'd never like. Growing up, I'd tried them both mashed and baked, and, no offense to my mom who is a wonderful cook- Blech! Still, I knew they were healthier than the traditional potato, and since I can be a bit of a health nut at times, I did not give up on them. One day I decided to try roasting them, one batch with garlic and salt, and the other with rosemary and salt. A hit! I now cook with sweet potatoes at least as often as with any other kind, and I always roast them. For Thanksgiving last year I decided to dress them up with thyme and garlic, and they were received with much success. I have to be honest and say that I have not figured out how to get them to be as crisp on the outside and tender on the inside as a russet or yukon gold. It seems to be a mystery for many a roasted-sweet-potato lover. But I can recommend some things that will help them to be not quite so moist. Roast at a high temp. A higher temperature will always cook the outside much faster than the inside, drying the outer portion while the insides retain a much cooler temp and some of their moisture. Don't let the potatoes touch, and definitely don't pile them onto each other. It'll cause them to steam each other. I did read from one blogger that she adds a bit of sugar to the bowl before tossing all the ingredients together. I tried this, and it did help a bit and it didn't affect the flavor very much, but, like I said, I like to make the healthier choice when I can. In a large mixing bowl toss all ingredients. Spread the sweet potatoes onto a large heavy cookie sheet or large baking dish, making sure they don't touch. (Think Adrian Monk.) Roast for about 30-40 minutes, depending on how thin you cut the pieces. Serve as a side dish to Menu #2!